How do you interpret the equivalence principle of gravity and acceleration? 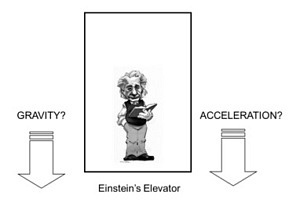 Einstein said: standing in a hypothetical closed elevator, you cannot determine whether you hang still and feel the effect of gravity of a planet nearby , or you feel the same effect caused by the elevator accelerating out in space. What about General Relativity effects then? Maybe you would expect that clocks in heavier acceleration would tick slower than clocks in rest. Then you support the supposed ‘strong equivalence principle’. Clocks are influenced by speed and gravitation, nót by acceleration. Walter Kündig did an experiment (1963) and proved it.